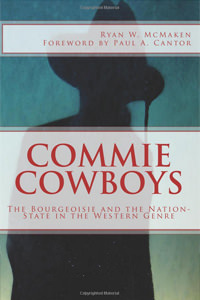 The Western genre has long been associated with right-wing and libertarian politics, and is said to promote individualism and free-market economics. In a new look at the Western, however, Ryan McMaken shows that the Western is in fact often anti-capitalist, and in many ways, the genre attacks the dominant ideology of nineteenth-century America: classical liberalism. The classical Westerns of the mid-twentieth century often feature wealthy capitalist villains who oppress the cowardly and defenseless shopkeepers and farmers of the frontier. The gunfighter, a representative of the law and order provided by the nation-state, intervenes to provide safety and justice. In addition to attacks on capitalism, the Western attacks other prized values of the bourgeois middle classes including Christianity, education and urbanization. McMaken examines these themes as used in the films of John Ford, Anthony Mann, and Howard Hawks. These pioneers of the classical Westerns are then contrasted with later innovators such as Sergio Leone, Sam Peckinpah, and Clint Eastwood. Also included are discussions of the role of the LITTLE HOUSE ON THE PRAIRIE series, Victorian literature, and the nature of crime on the historical frontier. With a foreword by Paul A. Cantor, author of GILLIGAN UNBOUND and THE INVISIBLE HAND IN POPULAR CULTURE.